A satirical political party in Iceland won a plurality of seats in the country's capital. They're now communicating with another major party about coalescing. "However, Eggertsson has yet to watch the American television series The Wire and Gnarr recommends that he does. Throughout the election, Gnarr has said that he will not consider a coalition with anyone who hasn’t seen The Wire." This is a perfect example of comedy politics, which is what I wrote my personal statements about to every target law school, including Harvard and Northwestern. This is exactly what I plan to do in the future. Good for Iceland! I think these comedians will be noticeably more frank, practical, competent, and moral than normal politicians. This will be a good test of the value of comedy politics. Hopefully they won't turn out to be corrupt assholes, or even worse, boring. I've been puking my "guts" out with joy all day at the news of a possible Ebola cure! I made it onto Cute Boys with Cats! This is the high point of my pictures with cats career so far. At some point I'll collect all my pictures with cats and post them here. A bunch of other tumblrs have reposted that picture too, including a gay tumblr that mostly posts photos of hot naked dudes!! Divorces between obscenely rich people are a great opportunity for people to realize that nobody deserves that much money, whether it's the attractive dependent spouse or the one considered to have earned it. It's shameful that a person can't read stories about these absurd situations of extreme wealth and extreme poverty in the same newspaper and put the pieces together. and then watch the beginning of Season 2 Episode 4, "Mac Bangs Dennis' Mom" where he's standing at the door and says "Yeah I guess" again. I just thought it was cool to hear. 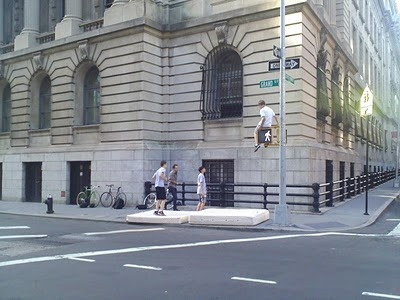 Kids jumping onto a couple mattresses on the street in the Lower West Side. One is about to jump from the walk signal! Taken with cell phone. Click on the image for the bigger, better version. I can't believe Law and Order is being canceled after 21 seasons!! With this ending at the same time as LOST, where will all the TV babies get their formula?? Sandwich named after famous actor Al Pachinio, at an Italian counter restaurant. On the menu they left out an h and an i for some reason though. I just watched League of Extraordinary Gentleman Origins: Sherlock Holmes starring Robert Downey, Jr. He's too short to be Sherlock Holmes. Also there were all the other problems with the movie. It was fine though. I'm glad they at least made Watson a cool guy like in the books instead of an oaf. Sorry, between this absurd number of papers I need to do and the search for a post-graduation job, I haven't added anything to the site in a while. Don't worry though.